Serving The Greater Dallas Area, Including Plano, Arlington, Irving, Richardson, Mckinney, Garland, and more. I was very pleased with Dent Mechanics Group. Particularly Brett was very professional and curious. I had a great experience with Dent Mechanic Group! They made the whole process easy for me and worked directly with my insurance company on my behalf. They even brought the rental car to my place and took it back after my car was repaired. It was really the most stress-free way to go and the staff was very communicative, as well. I'll recommend it to anyone who needs a dent repaired. Wow, had a small dent in my car, took it in for estimate, got it repaired while I had lunch! I've very picky about my car and they made it like new again. Less than an hour and you can't see the dent any more. Could not be happier with their service. HIGHLY RECOMMENDED. Contact Dent Mechanic Group for your free auto hail damage evaluation. Our paintless dent removal specialists can also come to your home, office, or other location at NO COST or obligation. Dent Mechanic Group’s goal is to inspect your hail-damaged vehicle, and answer any questions regarding the paintless dent repair process. Many customers believe their insurance premiums will increase due to an auto hail repair. This is NOT true; instead, hail dent removals and hail damage repairs are covered under your comprehensive auto policy. Dent Mechanic Group helps contact your insurance provider for the paintless dent removal process to eliminate any uncertainty and hassles. 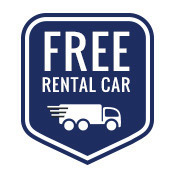 Step 3: We Arrange A FREE Vehicle Rental For You. If your insurance policy does not include car rental coverage, Dent Mechanic Group arranges a free car rental while we repair your hail damaged vehicle. Typically, we meet customers at a nearby and prearranged Enterprise rental car location, so we can exchange and/or pick up your free rental car. Dent Mechanic Group will schedule a convenient time and location to pick up your hail damaged vehicle at our centrally-located auto body shop near Dallas, Texas. After Dent Mechanic Group brings your hail damaged car to our garage, our technicians – who specialize in paintless dent removal in Dallas and have decades of experience – perform a thorough inspection of your vehicle to identify all dents and dings caused by hail (including the obscure dents that cannot be seen under bright sunlight.) Then, we build a detailed hail repair evaluation based on industry standards and specialized auto hail damage software. Learn more about our paintless dent repair process. Dent Mechanic Group contacts your insurance company’s assigned claims adjuster directly to schedule an inspection of your vehicle. This inspection is performed at our auto body shop in Dallas, Texas. During the examination, your insurance adjuster reviews your vehicle based on the hail damage our expert technicians previously identified. Our Dent Mechanic Group team monitors the process to make sure the adjuster does not miss any hail damage, dents, or dings. Unlike other traditional auto body shops that have relationships with your insurance company, Dent Mechanic Group helps negotiate the best possible claim on your behalf. Dent Mechanic Group’s expert technicians utilize custom auto hail dent removal tools, specialized techniques, and decades of experience to gently remove minor dents and dings caused by hail from the panels of your vehicle. Our hail dent removal technicians access the underside of the hail damaged panels to remove the dents through a variety of points. When Dent Mechanic Group’s technicians are finished repairing your vehicle with our efficient paintless dent removal technique, we wash your vehicle and schedule a convenient time to return your car. Learn more about our Comprehensive Auto Hail Damage Repair Warranty. Is Dent Mechanic Group Locally Owned And Operated? YES, Dent Mechanic Group is locally owned and operated. The majority of the companies in the DFW Metroplex are not local businesses; we are not one of those companies. Dent Mechanic Group was founded and operates in Dallas, Texas by a Native Texan. Will I Have To Pay My Deductible To Get My Car Fixed? No, we will work with you on your deductible to perform PDR /Auto Hail Repair to your vehicle or vehicles. To repair the hail damage to your vehicle or vehicles (or perform paintless dent repair), we will help to ensure that you pay out of pocket very little or nothing at all. We know that money can be an issue when having paintless dent removal performed on your vehicle. That being said, we guarantee that your out-of-pocket cost will be minimal, if not zero dollars, for the PDR we perform on your vehicle. We can discount repairs in a plethora of different ways ensuring that you pay out of pocket as little as possible. Do I Have To Get My Vehicle Repaired By A Shop My Insurance Company Tells Me, Or Suggests, That I Go To? The answer is NO. By law, where you choose to have your vehicle repaired is your decision. In fact, multiple insurance companies have had questionable practices in the past of “steering”, (read more about insurance steering here), and some currently still do. Sadly, some insurance companies still participate in steering because it allows them to cut corners on repairs and save money. 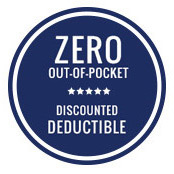 If you do choose to have your vehicle repaired at a “preferred shop”, you will be required to pay your deductible, as the preferred shops are contractually obligated to do so by the insurance companies. “Preferred vendors” of insurance companies are locked into pricing agreements by the insurance company. Sadly, repairs completed by DRP’s or (Direct Repair Facilities) may reflect the “agreed upon pricing” between the repair shop and the insurance company. More often than not, the quality of repairs are a night-and-day difference from a Non-DRP Facility to a DRP-Facility; insurance companies are in the business of making and saving money. Dent Mechanic Group is reputable and extremely qualified, the difference is, at Dent Mechanic Group we work for you, our valued clientele, not an insurance company! We help offset your deductible, give a lifetime warranty on all paintless dent repair work, handle the entire insurance process for you and assist with a rental car regardless of whether you have rental coverage. 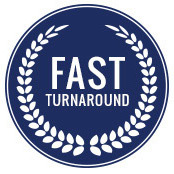 We have a much faster turnaround time, generally a 1-5 day turnaround on a car, truck or SUV assessed correctly during the initial assessment. We will cover your rental vehicle, pickup and delivery your vehicle, handle everything with the insurance company, saving you from paying out of pocket costs…deductibles, etc. We maintain an A+ rating with the Better Business Bureau, we are 5 Star Rated on Yelp, have plenty of references (both commercial and retail) and we ensure that the insurance company pays on all Auto Hail Repair/Comprehensive Auto PDR Claims that we handle. Usually in the insurance company’s first estimate, most vehicles are written around half-way below what they should be, and sometimes even more! With everything stated above, I think it is easy to see how we can pass along the savings to you, our valued clientele. Listed below are links of what occurs at some DRP facilities and disturbing articles about claims settlement through individual insurance companies. PDR: What Is Paintless Dent Repair, Paintless Dent Removal Or PDR? Paintless dent repair (PDR) is the most non-invasive, eco-friendly, and cost-effective method of auto hail repair available for returning your vehicle back to its factory condition after a hailstorm! We accomplish the paintless dent repair process by utilizing specialized, paintless dent removal tools, which are unique to the year, make and model of the vehicle. The process used to repair the vehicle is also dependent upon; the placement of the dents, which body panel they are on, if body lines are a factor, the difficulty of access to the hail damage or dents, the type of metal and many other factors. We use these specialized paintless dent removal tools and techniques to massage the back of the dent, eventually causing the dent to smooth out and coaxing the metal paneling into returning it to its original, undamaged state! There is another method known as glue-pulling to remove dents, regardless, after paintless dent repair is performed, your vehicle will look brand new (or as new as it can look depending on the vehicle’s age). 7. All body work repairs are reported to CARFAX and lower the resale and trade-in value of your vehicle. You will never get a better paint job on your vehicle than the paint job your vehicle received at the factory. paintless dent repair, on the other hand, preserves your vehicle’s value, as if you never received hail damage! With paintless dent removal, there is no sanding, Bondo, paint matching issues, aftermarket parts that do not fit correctly, toxic chemicals, structural integrity issues, heating, dry ice or painting involved! If you ever choose to sell or trade in your vehicle, no one will ever know that your vehicle ever had hail damage! Paintless dent repair will not devalue your vehicle or affect the structural integrity in any way. 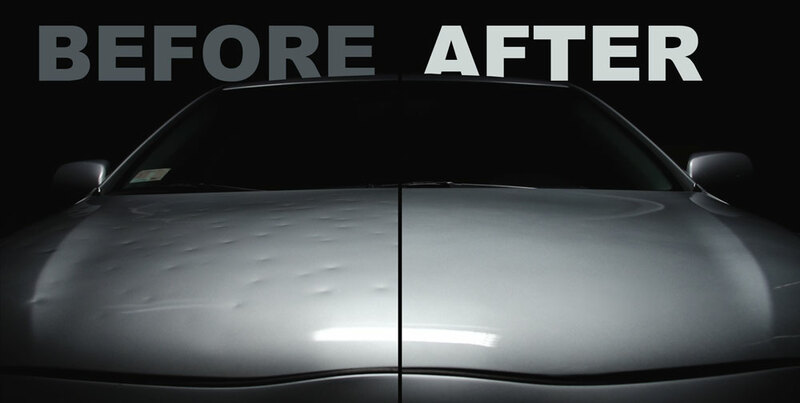 Paintless dent repair is the absolute best method for your automotive hail damage repair needs! My Insurance Company Recommended Replacing Parts On My Estimate, Does That Mean That I Have To Replace Those Parts? The answer is NO. If the paintless dent repair cost on a panel exceeds the replacement cost of a panel, the insurance company will always go the more cost-effective or cheaper route to save themselves money. This is the reason that insurance companies may write to replace your roof, hood and decklid (or trunk) panels at replacement cost rather than paintless dent repair on your estimate. The work you choose to have done on your vehicle is your choice, and your choice alone. Be sure to ask the opinion of a paintless dent repair specialty shop before making your final decision! How Does Paintless Dent Repair (PDR) Work? Our highly qualified and trained technicians use special tools to apply pressure to the backside of the dent, gradually pushing it outwards and elevating it to its original position. At times, a bonding tab can be placed directly in the center of the dent to pull it up. With these methods, the dent is repaired seamlessly without any evidence of repair or disturbance to the finish. The results are spectacular, and the vehicle owner no longer has to worry about replacing parts or refinishing/repainting the vehicle’s surface. In turn, the vehicle’s value never diminishes value because of the PDR repair method saving the factory parts, panels, and paint job. When possible, paintless dent repair is the most viable repair process when it comes to repairing hail damage! In the early 1990’s, before paintless dent repair was approved as a viable method of hail damage repair for vehicles,State Farm conducted a 2-year study with various industry leaders on the process of paintless dent repair. We have had the privilege of training under some of these leaders. Before the experts would co-sign that paintless dent repair was a viable option, they wanted to be sure that it caused no damage at the microscopic or structural level. More importantly, they wanted to ensure it did not jeopardize the integrity of the vehicle paneling or safety measures/devices. After the two-year study was complete, State Farm concluded that paintless dent removal is the best available option for repair of auto hail damage. Soon after, other insurance companies began to endorse PDR as the most viable repair method for hail damaged vehicles. To this day, no other method of repair is better than paintless dent removal for fixing hail damaged vehicles! When Is Paintless Dent Repair (PDR) Recommended? Paintless dent repair (PDR) is best used to repair damage caused by hailstorms, or similar types of dents that may occur due to an object striking the surface of the panel. This method of dent removal is recommended by all insurance companies and is the most viable option to repair hail damage, dings and dents that have not caused damage to the finish of the vehicle. What If I Do Not Get The Hail Damage To My Vehicle Repaired? A restriction of “unrepaired damage” will go into effect on your insurance policy, and any future claims will be denied until your hail damage is repaired. Depending on the year, make, and model of the vehicle, you also take a chance on having an accident. In this case the hail damage and collision damage would be combined, possibly causing your vehicle to become a total loss! Do not risk it! You are also taking a chance being hit by another hail storm, which can exacerbate damage beyond what is repairable by paintless dent repair.In turn it can result in body work or conventional repair being your only option,devaluing your vehicle tremendously in the process! How Long Do I Have To Get My Vehicle Fixed? In most cases, insurance checks are valid for 180 days. However, your estimate is based on current labor and parts rates, which are subject to change. Waiting to fix your vehicle will also increase your risk for “unrepaired damage” complications. The whole process from start to finish should only take 1-5 days; don’t chance it! Let us handle the headache of dealing with the insurance company and fix your vehicle now. The definitive answer to the question is; there is no time limit for filing a comprehensive claim. It is worded in the policy as filing “within a reasonable time”, which can have many interpretations. Will Filing A Claim For Hail Damage Cause An Increase In My Monthly Or Annual Insurance Rates? Hail damage is considered a comprehensive claim and is considered an act of God, which, by insurance standards means the event was beyond your control. In most cases regarding collision, both parties have a percentage of fault. It is illegal for insurance companies to raise your rates based upon an act of God. Instead, they will use a loophole by raising rates on entire zip codes in affected areas, so chances are your rates will already be going up, regardless of if you are fixing your vehicle or not! Since most cars can be repaired in 1 day, Dent Mechanic Group will provide you with shuttle service. If more time is required to fix the vehicle, it is our pledge to you that we will provide you with a free rental vehicle! What Type Of Results Can I Expect From Dent Mechanic Group? At Dent Mechanic Group satisfaction is 100% guaranteed, in writing, with our lifetime national warranty, which we back all work with! Our promise to you is, complete repairs correctly, the first time, every time! So what do you have to lose? Call us today to save time and money! By choosing Dent Mechanic Group, customers can be rest assured of outstanding customer service in the following areas; immaculate repairs completed by highly qualified and experienced, paintless dent repair technicians, zero out of pocket expense and a lifetime national warranty to back our work. Repairs typically take 1-5 days (sometimes 7-10 days contingent upon damage, placement of damage, type of metal and what’s in the queue) or in other words, the severity of the hail damage and volume of cars in the shop. Let us bring your vehicle back to that showroom look! If your vehicle has suffered Auto Damage from a hailstorm, Dent Mechanic Group is the perfect solution for your PDR needs. Call (214) 613-3423 and one of our PDR specialists will be happy to assist you! Thank you for choosing Dent Mechanic Group for all of your auto hail repair needs, we appreciate your business, loyalty, confidence and patience. We look forward to helping you! Where Is Our Service Area? 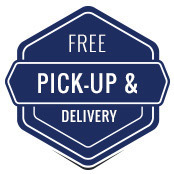 We service the entire DFW metroplex, no matter where you are, we will come pick your car up to make things easy on you! Plano, Richardson, Mckinney, Addison, Valley Ranch, Irving, Allen, Frisco, Little Elm, Melissa, Farmersville, Dallas, Farmers Branch, Carrollton, The Colony, Lewisville, Flower Mound, Grapevine, Coppell, Euless, Bedford, Ft. Worth, Arlington, Cedar Hill, Waxahachie, Red Oak, Lower Greenville, Lakewood, Bishop Arts, Deep Ellum, Oakcliff, Duncanville, Forney, Sachse, Wiley, Rowlett, Garland, Mesquite, Balch Springs, Seagoville etc.